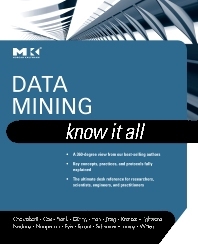 Data analysts, Data modelers, Database R&D professionals, data warehouse engineers, data mining professionals, undergraduate and graduate students who want to incorporate data mining as part of their data management knowledge base and expertise. Earl founded and serves as President of, Scianta Intelligence, a next generation machine intelligence and knowledge exploration company. He is a futurist, author, management consultant, and educator involved in discovering the epistemology of advanced intelligent systems, the redefinition of the machine mind, and, as a pioneer of Internet-based technologies, the way in which evolving inter-connected virtual worlds will affect the sociology of business and culture in the near and far future. Earl has over thirty years experience in managing and participating in the software development process at the system as well as tightly integrated application level. In the area of advanced machine intelligence technologies, Earl is a recognized expert in fuzzy logic, and adaptive fuzzy systems as they are applied to information and decision theory. He has pioneered the integration of fuzzy neural systems with genetic algorithms and case-based reasoning. As an industry observer and futurist, Earl has written and talked extensively on the philosophy of the Response to Change, the nature of Emergent Intelligence, and the Meaning of Information Entropy in Mind and Machine. Mamdouh Refaat is a data mining and business analytics consultant advising major organizations in North America and Europe. He has held several positions in consulting organizations and software vendors, including the director of consulting services at ANGOSS Software Corporation, a global data mining software and service provider. During his career, Mamdouh has managed numerous data mining consulting projects in marketing, CRM, and credit risk for Fortune 500 organizations in North America and Europe. In addition, he has delivered over 50 professional training courses in data mining and business analytics. Mamdouh holds a Ph.D. in Engineering from the University of Toronto, and an MBA from the University of Leeds. During his career, Mamdouh has managed numerous data mining consulting projects in marketing, CRM, and credit risk for Fortune 500 organizations in North America and Europe. In addition, he has delivered over 50 professional training courses in data mining and business analytics. Mamdouh holds a PhD in Engineering from the University of Toronto, and an MBA from the University of Leeds. Markus Schneider is an Assistant Professor in the Computer Science Department of the University of Florida and holds a doctoral degree in Computer Science from the University of Hagen, Germany. He is author of a monograph in the area of spatial databases and of a German textbook on implementation concepts for database systems, and has published about 40 articles on database systems. He is on the editorial board of GeoInformatica.